The American man of money refuses to be separated by any distance from the centre of his business interests, and the American woman of wealth is of a restless turn of mind more anx­ious to be fashionable than comfort­able. Thus she spends the early spring abroad, midsummer at the seaside, and the early autumn at the mountains, returning to the city in time to enter into a season of winter gayeties. 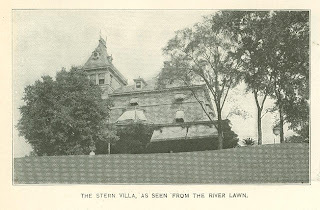 Nevertheless, since it is decreed by fashion that a so called home on the Hudson is a necessary adjunct to a proper standing in society, a palatial house, with the accessories of servants, well-kept grounds and conservatories, is maintained, as children say, for the "show of the thing." The English country house is lite­rally the dwelling place of the family, the older members going to London once a year only for a short season. In this home the children are born and educated, as their fathers were before them, and from this same place they are in turn carried to their final resting place. The early settlers in America came from England and Holland strongly imbued with the love of a permanent home. 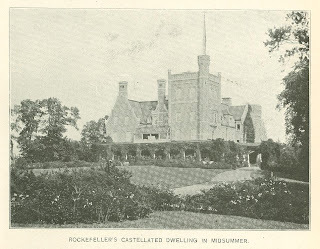 Thus, while the borders of the Hudson present a series of costly resi­dences representing the wealth and ex­penditure of modern society homes occupied, as was mentioned before, the greater part of the time by servants -­ there are as well a number of manor or so - called "farmhouses," built by the early settlers, that have borne in times past much the same relation to their owners as the English home bears to its lord and master. The old mail route, or King's High­way, which skirts the Hudson and has its terminus at Albany, is now known as Broadway, and from it open the present fashionable country homes, built for prestige and landscape gar­dening only, and the old historic manors that in their day combined the comforts of a home life with the utili­tarian purposes of a farmhouse. It was there the farmers, who were really gentry of landed estate, culti­vated their acres, while the housewives superintended the maids and stitched for a wondering posterity those mar­velous yards of quilted linen orna­mented with garlands and wreaths of embossed flowers. So persistently pa­tient and far seeing were these thrifty and gentle ladies that it was no un­common occurrence for a mother to begin a quilt of elaborate design on the birth of a daughter, for the pur­pose of presenting it to this same daughter as a wedding gift. That part of the Hudson that may now be classified as the fashionable precinct includes Riverdale, Yonkers, Hastings, Tarrytown, and Dobb's Ferry. Within its area may be found the pala­tial structures of the Rockefellers, Mrs. Elliot F. Shepard, J. 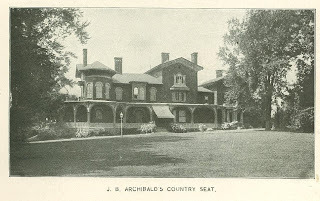 B. Archi­bald, the Standard Oil magnate; "Lyndhurst," for many years the home of Jay Gould, and now the residence of his daughter; the Munro and McComb places, the two last but re­cently completed. It is quite two hundred years ago since the land lying between Fishkill and Wappinger Creeks, owned by the Wappinger Indians, was bought by the Huguenot Rombout and Guillian Ver­planck, a Hollander, partners in trade. In the year 1703 Catharyna, a daughter of Rombout, and her husband, Roger Brett, left their town house, near Old Trinity on Broadway, and built the Brett manor, which is still one of the landmarks of the Hudson in the neigh­borhood of Matteawan. Another old homestead is the New­lin House, built in 1740 by Isaac de Peyster, who married Maria van Bal­len, a half-sister of Mme. Brett. It stands at the mouth of the Fishkill, surrounded by magnificent locust trees. It commands an extensive view of the Hud­son and the great Shunnymunk moun­tain, known as the "Sleeping Giant" of the Indian. 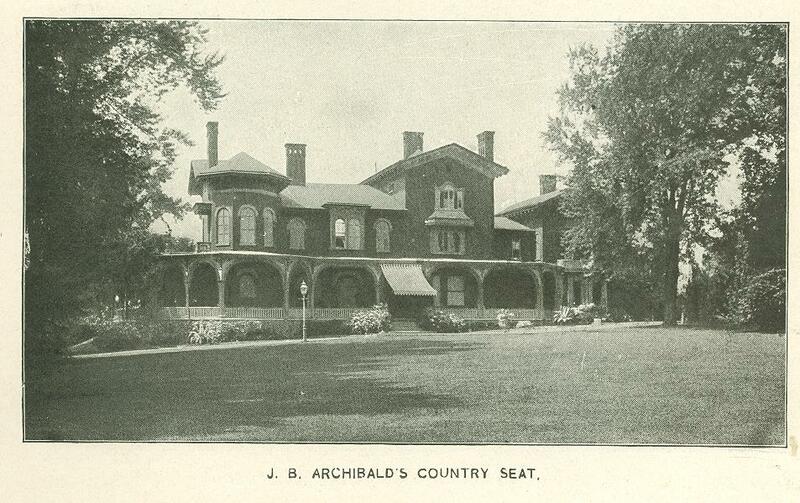 The house is built of brick and was large and costly in its day. The grounds slope to the creek, and on account of their beauty were known as "Fairy Isle." Isaac de Peyster and his descendants lived there for years until it finally became a part of the Newlin's estate. The Verplanck house is another landmark lower down the river. It was built in 1768 by Philip Verplanck to replace the old house built by his uncle, who died in 1745. It is in good condition, and is an excellent example of the architecture of its day. The date, 1768, is marked in the gable by black bricks. The mantels and quaint Dutch doors are still preserved and shown to visitors. The Dirck Brinckerhoff homestead was a part of 1,700 acres purchased from Mme. Brett by Dirck Brinckerhoff for his sons, John and Abraham. It was built in 174O, and had an extended view toward the Highlands through which the old Albany and New York post road winds. At this house Colonel Brinckerhoff, the son of John, entertained at different times Washington, General Lafayette, and John Adams. These old structures are construct­ed modestly, for the most part of wood, with shingle sidings, in striking con­trast to the costly modern edifices of granite and marble. The residence of Mrs. Elliot F. Shepard, for instance, in North Tarrytown, is modeled after the style of Kimberley Hall, the seat of the Earl of Kimberley. It is of buff brick with white stone dressings, has a front­ age of two hundred feet, flanked by magnificent marble porticoes. 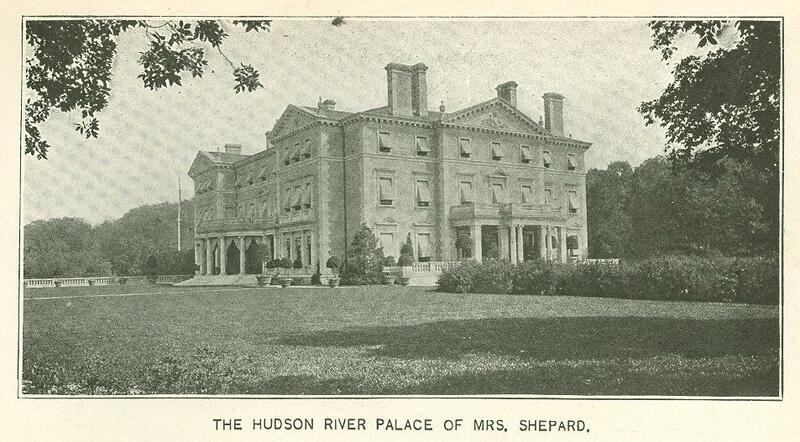 It stands on an eminence facing the Hudson, and is a fine example of the style of an English gentleman's home. William H. Rockefeller's place com­bines an old Norman tower with an English manor, fronted by a cloister. This is said to be a copy of Arundell Castle in Sussex. The gardens are in Italian style, with slopes and terraces, beds of flowers, and playing fountains. There are three hundred acres of ground around the house. The oaks and elm trees are famous for their beauty. The greeneries are second only to the Gould conservatories; the stables are palatial in their way and can accommodate as many as fifty horses. 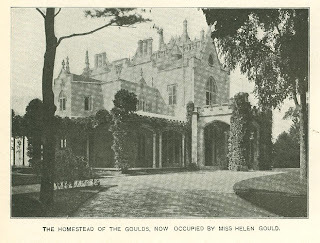 "Lyndhurst," the Gould residence, is one of the best known of the modern places on the Hudson. It has been the Gould home for years. In fact, Jay Gould was so deeply attached to it that he seldom left it during the last years of his life. It partakes more of the character of a home than most dwell­ing places of the rich. Miss Helen Gould, like her father, seldom leaves the spot, and, like him, she devotes much of her time in developing the great conservatories, which are consid­ered the finest in America. The home of the late Norman L. Munro, the publisher, and now occupied by his widow, is a somber house in gray slate, with pointed roof and high gables. It is surrounded by wide piazzas with sloping roofs. The portecochere is imposing, and the house, although subdued in coloring, is relieved by barzes, highly decorated and quaint­ly carved, and from the mullioned win­dows project fantastic little balconies, which, like the barzes, are carved and gaily colored. The house is surround­ed by well wooded grounds and is almost lost in the masses of verdure that shelter it. But the villas men­tioned and illustrated are only a tithe of those which deck the Hudson. Originally published in Metropolitan Magazine. November 1898.